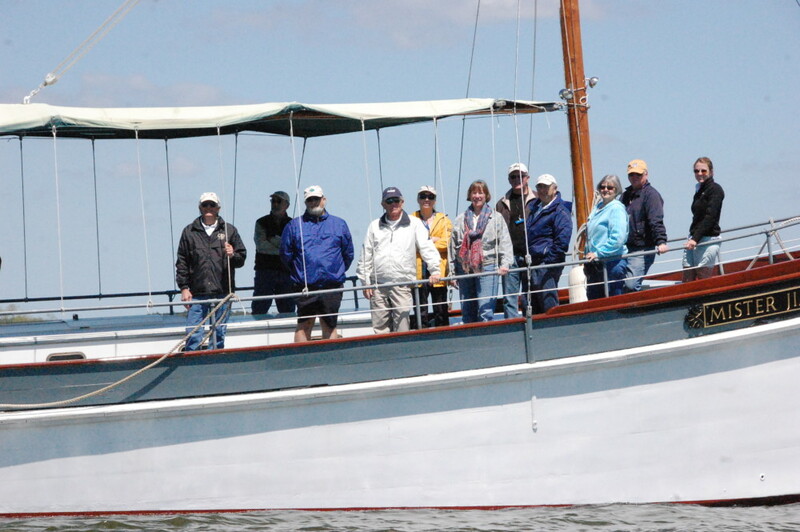 The volunteer crew of the Chesapeake Bay Maritime Museum’s (CBMM) Mister Jim has completed all training and certifications to start taking passengers out on scenic river cruises beginning May 25 and continuing through Labor Day. Volunteers are led by USCG Certified Captains and include from the left: Captain Lloyd Devigne, Bob Hinkel, John Lindinger, Duane Lundahl, Lin Moeller, Mary Sue Traynelis, Creston Cathcart, Lou Berman, Anne Hughes, and Jack Davis, along with CBMM Director of Education Katie Livie. The 30-minute Miles River cruises run Fridays through Mondays at 12 noon, 1pm, 2pm and 3pm, with passengers boarding alongside the 1879 Hooper Strait Lighthouse and tickets available at CBMM’s welcome center. Mister Jim carries up to 24 passengers, with cruises available to museum visitors at $10 per person or free for kids 16 and under. For more information, call 410-745-2916 or visit www.cbmm.org.